This whole kitchen thing started because we wanted to widen two doorways (from the den to our kitchen, and from the living & dining room to our kitchen). In our typical 50’s brick ranch, just about every room is connected by a narrow doorway. It’s got great bones (and a fantastic all glass sunroom) but we just want to improve the flow of the house and make everything a little more open. I, whether brilliantly or foolishly, suggested we close off a third door in our kitchen that leads to our current dining room (so we can convert the dining room into the third bedroom that we bought it as), move the dining area into our already giant and open living room and rearrange the whole kitchen to get more cabinet and counterspace. I suggested this as a “way-down-the-road” project, but within days we had contractors coming by to give us estimates. I guess I had forgotten that we operate on a very short road in this household. 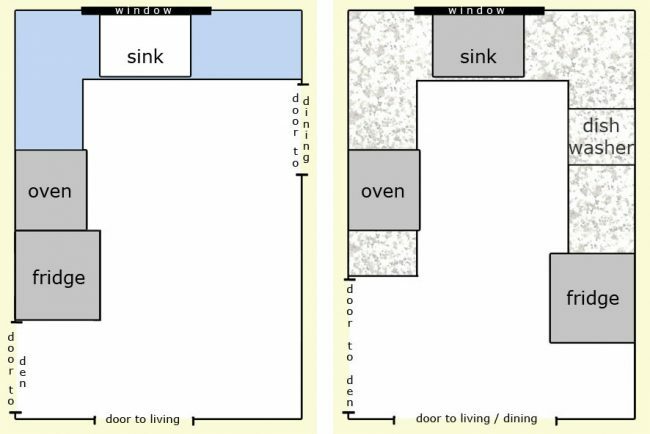 We’ve already given a kitchen designer all the measurements (more on that later) and had her cabinet & counter guy come measure the space. We’re planning to meet with her next week for the verdict on just how close we can get to our dream kitchen…and how much it’ll cost us. I was looking through some old posts- I have a little nook next to my fridge like you do on your “after” picture above, I don’t think I’ve ever noticed in later pictures- what have you done with that little area? I’m a huge fan of your blog and have been following for almost two years now. Today, I’ve run out of things to surf (is that possible?) and I decided to take a peek at the beginning of your blog. So funny, but I was going to ask the same question Bailey did. Never noticed that nook until seeing the floor plan. It’s a perfect thing for the space and I love that you walled in the fridge for a built in look. I was wondering how many square feet your first home was? It looked so lovely and quaint but really open and bright too! Also, was this diamond in the rough in an already well loved neighborhood or did many of the homes need updating? My husband Dan and I are starting house shopping and I would really love to fix up an older home (the one I grew up in was an 80 year old brick home that my parents restored and made so charming) but we are only finding beat down neighborhoods where the older homes with character are. Do you have advice for finding a fixer-upper after being successful twice with house hunting and now selling? Dan said that it was smarter to buy the older, in-need home in a well cared for area so that its value rises and isnt challenged by other homes…ugh, lack of value, than it was to restore a great fixer-upper in a less valuable area because its value still wont be so great in the end. This makes sense to me but do you have any other words of advice? Our first house was 1300 square feet. And desperately in need of some tender loving care! The neighborhood was a good one with great schools and many other old ranches (some that were already fixed up, and some like ours that weren’t). Our goal is always to try to find the worst house in the nicest neighborhood (so we agree with Dan), but since it was hard to find a perfect neighborhood with one “bad” house, we settled on a nice neighborhood with nice schools that felt like it would retain its value (or even grow in value as others fixed up other homes nearby). Although there were a few other houses in need of love, in the four years that we lived there two other young couples moved in and fixed their own ranchers up. So we felt like the neighborhood was getting a bit of nice refreshing, which is always important. Hope it helps! I think it was 13 by 12?